This latest release of FotoIN now provides field users with the ability to pin photos to floorplans and blueprints. Pin location data gets embedded in the photos by FotoIN, just like all other file creation and custom metadata, and enables Enterprises to further automate photo workflows with their preferred plan solution like Autodesk’s BIM 360 or Bluebeam. When users step onto a project, they will be able to snap photos, tag, comment, annotate them, and now also add a pin for the location of the photo on the floorplan. Users can now access floorplans directly from the camera screen within FotoIN Mobile app. FotoIN system processes a PDF floorplan into an image file which is smaller and easier to work with on the mobile device. This enables lighting fast user experience in the field, and does away with those long loading times, frustrations and hold ups on site related to working with heavy PDF blueprint files on your mobile device. 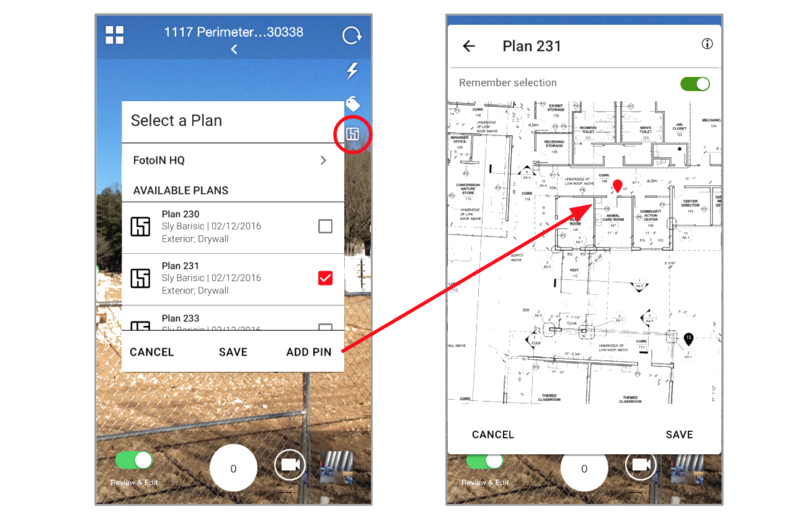 New Plan Icon on Camera Screen: When field users step into a project with associated floorplans, they will be able to tap on the plan icon to select from a list of plans. Photo will be associated to selected floorplan with or without a pin. Add Plans to Projects: Floorplans can be added to a Project on the Admin Console, when creating new or editing existing projects. For information about pinning photos to floorplans and blueprints, please contact us at sales@fotoin.com.